It’s officially strawberry season! When I think of strawberries, I think fresh strawberry pie. Mostly because it’s super easy to make, yet totally delicious. To make it extra easy, buy a pre-made pie crust….don’t worry, I won’t tell anyone. Cut strawberries in half and place in a bowl with sugar and lemon juice. Let macerate for five minutes. Meanwhile, make glaze by placing all ingredients in a medium size saucepan over medium heat. Stir and combine just until preserves melt into a thick glaze. Strain juices from bottom of bowl and combine glaze with strawberries. 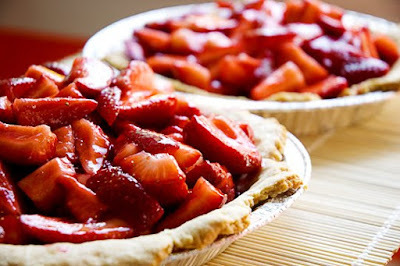 Dump strawberries into pre-baked pie crust. Serve with a huge dollop of fresh whipped cream! Very nice recipe – perfect for all those super sweet strawberries at the farmers’ markets right now. 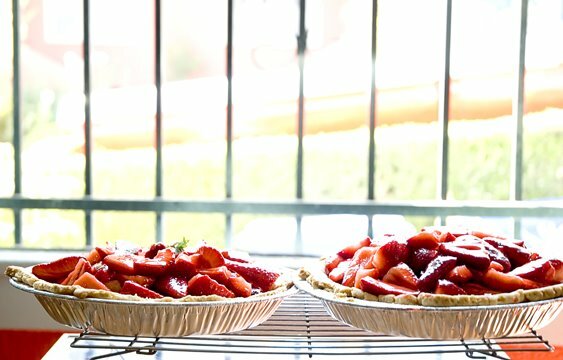 I love that this pie really lets the flavor of strawberries shine. Thanks Allison, yes, this recipe is all about the strawberries. Made this yesterday, and it was delicious!! However, the glaze didn’t thicken after it cooled, but stayed fairly soupy. It had the most amazing flavor, and we enjoyed it wholeheartedly. Any advice on the glaze? I’m glad you liked it! I’m not really sure how to correct the soupy glaze though…maybe add less of the glaze to the strawberries? Also, try refrigerating the glaze prior to adding it to the strawberries. When I made this, I had a little bit of the glaze pool at the bottom but not much.